Following apply to Flex Pro and Sunshine Pro themes. Theme Footer area has three main sections. This include: secondary navigation menu, footer widgets and footer credits info. Any menu selected as ‘Secondary Navigation’ will display above the Footer widgets area. Read more about configuring navigation menus in the Flex Pro theme. Here are instructions to configure navigation menus in Sunshine Pro theme. Footer widgets section is completely flexible in the Flex theme. You can choose to display any number of footer widgets (between 1 to 4) in this section. 1. 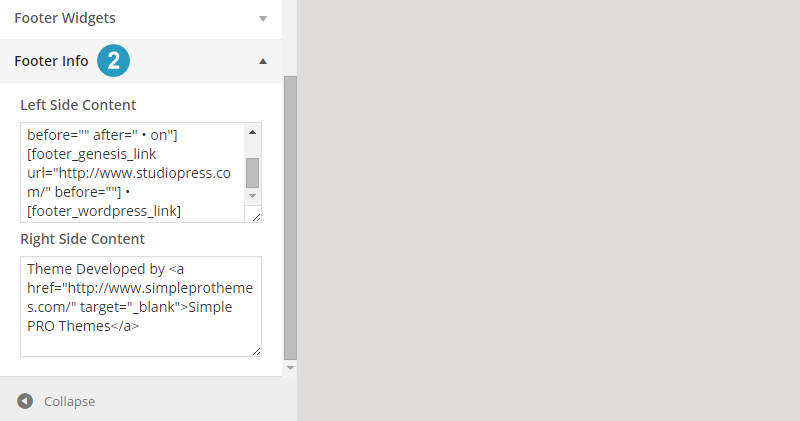 To change the number of footer widgets, go to Appearance > Customize. 2. Expand the Footer Widgets section and select number of footer widgets from the drop down box. 3. Then go to Appearance > Widgets option. Add any widget to: footer widgets 1, footer widgets 2, footer widgets 3, footer widgets 4. Note: Footer widgets 1 must have at-least one widget active if you want content of footer widgets 2, 3, 4 to display. From this section you can edit and change website credits (footer links) displayed at the bottom left and the bottom right part of the Flex theme. 1. Go to Appearance > Customize option in the WordPress Dashboard. 2. Click to expand the Footer Info section. 3. Then edit contents in the ‘Left Side Content’ and the ‘Right Side Content’ sections. Do remember to click the Save and Publish button before closing it.